Zimbabwe-born British boxer Dereck Chisora warmed up for his European heavyweight title fight with a routine win at the weekend. The Finchley puncher, who recently signed with Eddie Hearn and Matchroom Sport, is targeting a rematch with Dillian Whyte. But before that, the fight against Agit Kayabel for the blue belt – which will take place on November 4 at the Salle des Etoiles in Monte Carlo – or anything else, it was up to "Del Boy" to get rid of the ring rust against Robert Filipovic. Filipovic, who is from Germany by way of Croatia, came in as a late replacement for Jay McFarlane and he sadly boxed like one. Two points off and something of a farcical fight led to the majority of the crowd being disinterested. But the referee, Mark Lyson, spared everyone from having to endure further punishment by calling a halt to the fight midway through round five. Next up for Chisora will be a November 4 showdown with Kayabel for the European heavyweight title in Monte Carlo, which the Brit will hope results in a rematch with Whyte at some point in 2018. 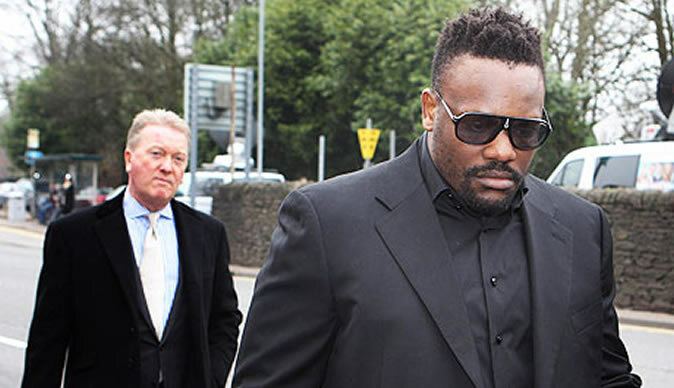 "I had enough power to take this guy out, but I wanted to enjoy it," Chisora said after the fight. "This was just to see if I can still walk towards the ring, and I enjoyed it. That was the whole point of this fight, fair credit to him, he came in for the first two mins of the first round and I felt his power. "He wanted to go six rounds, and say he has gone six rounds with Dereck Chisora." Chisora then used the interview to call out current WBC heavyweight world champ Deontay Wilder, who is without a fight after Luis Ortiz failed a drugs test. "The Bronze Bomber is a liar, a disgrace to the boxing world. When he is ready to play with the big boys he should pick up the phone. "He might have the title, but it means nothing to me, I want to take his title." It'll be back to camp now for Chisora, who will hope that the fight with Whyte will come to fruition and be made for early in 2018 after the aforementioned Hearn revealed on Saturday that the Brixton man will appear on the under-card of Anthony Joshua's IBF, WBA Super and IBO heavyweight world title showdown against Kubrat Pulev on October 28 at Cardiff's Principality Stadium. On Saturday, it wasn't hard to tell that Filipovic was a late replacement for Chisora.